BOTTOM LINE: Chris Sale and the Red Sox will host Aaron Judge and the Yankees in Game 1 of the ALDS. Judge has been a tough out in the past week, batting .333 with four hits and two home runs for New York over the past seven days. Boston has a collective .268 batting average on the season, led by Mookie Betts‘ .346 mark. The Yankees have gone 9-2 in Happ’s starts. New York’s lineup has 206 home runs this season, Giancarlo Stanton paces them with 38 homers. 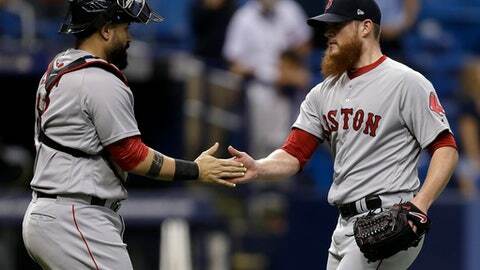 The Red Sox won Sunday’s contest 10-2. Eduardo Rodriguez picked up his 13th win of the season. TOP PERFORMERS: Miguel Andujar has 169 hits for the Yankees this season. He’s batting .297 on the year. Luke Voit has four home runs and 13 RBIs while slugging .795 over his past 10 games for New York. J.D. Martinez has 42 home runs and 127 RBIs on the season for the Red Sox. Rafael Devers has four home runs and 10 RBIs while slugging .632 over his past 10 games for Boston. LAST 10 GAMES: Yankees: 7-3, .254 batting average, 3.50 ERA, outscored opponents by 23 runs. Red Sox: 5-5, .292 batting average, 5.07 ERA, outscored opponents by 18 runs.